Windows 7 will most likely offer users a pleasant surprise, at least through its redefined interface and the set of redesigned tools it brings. The plain old calculator suffered a beautiful transformation into a more consumer-oriented product capable of serving both more science prone users as well as the average Joe. Windows 7 has introduced a completely revamped Calculator program (calc.exe) that has created enough oohs and aahs among users. 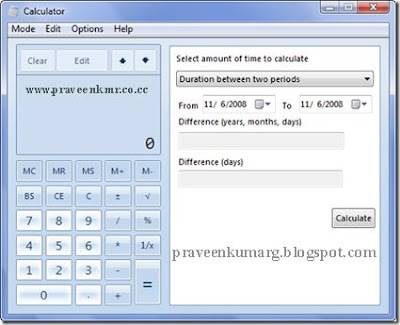 Two new modes got introduced in this version of calculator – statistics and programmer. There are also a number of ‘templates’ that are built-in, using which you can do your normal, everyday calculations like unit conversion, finding gas mileage, wage calculation, mortgage and lease payments more easily. Vista users who want to try out this new calculator can download this zip file, extract it to any location and run the calc.exe file. If you wish to replace the existing calc.exe, first make a backup of C:\Windows\System32\calc.exe and replace it with the one in the archive. Similarly, backup C:\Windows\System32\en-US\calc.exe.mui and replace it with the one in the archive. How about Windows XP? Can it be installed in that version, too?